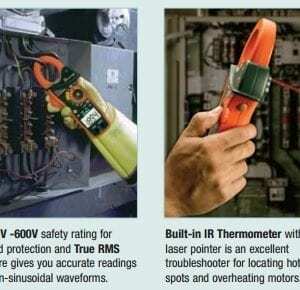 This CAT IV – 600V meter is made to withstand the most industrial applications. 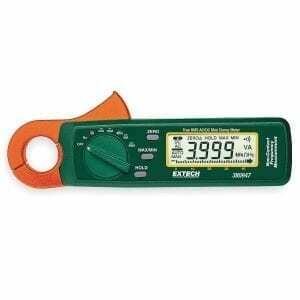 MultiMaster™ meter is a AC/DC True-RMS, high accuracy multimeter. 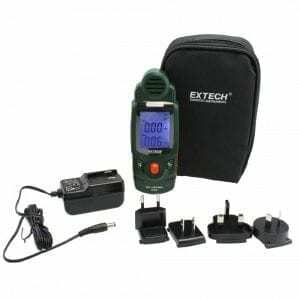 Features include trigger level, auto-off, continuity test, relative, hold, and peak capture. 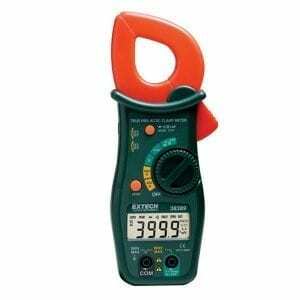 For process measurements, a 4 to 20 mA signal displays as 0 to 100%. 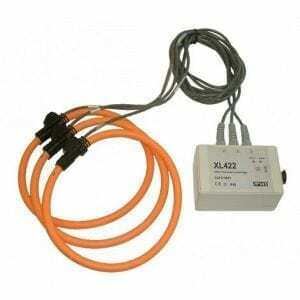 Download data to a PC via RS-232 input. 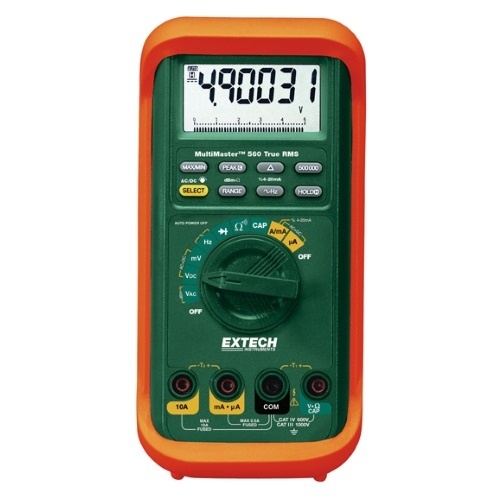 The Extech MM560A is part of the MultiMaster series of precision multimeters and ranks among the best in the Extech digital multimeter line. Designed with an emphasis on high accuracy, high resolution, and sophisticated functionality, the MultiMaster offers an unrivaled range of capabilities suitable for bench work while also a robust and durable meter for electrical and electronics testing in industrial and automated manufacturing environments filled with sensors, servos, and controllers. It is hard to beat the MultiMaster’s 0. 03 percent basic DCV accuracy. 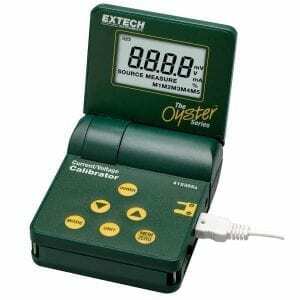 For benchtop testing and field troubleshooting of precision electronic components, the MultiMaster provides superior measurement confidence. 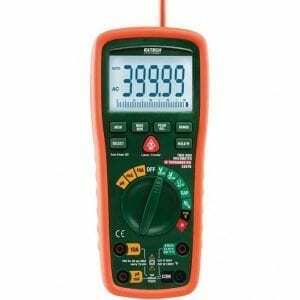 The backlit 6-digit display provides 50,000 count readings and an astounding 500,000 counts for DCV and frequency measurements. A useful segmented bar graph simulates analog testing and quick “needle-swing” tests. 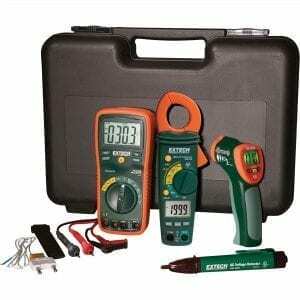 The full range multimeter measures voltage, current, frequency, capacitance, and resistance. 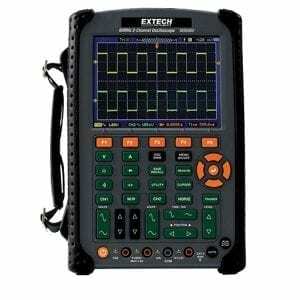 The frequency measurement mode is expanded with dual-range sensitivity for line (to 200 kHz) and logic (to 2 MHz) levels. 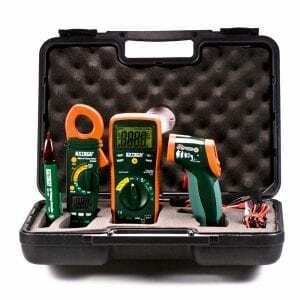 Users can perform dBm measurements with 20 preset impedances. 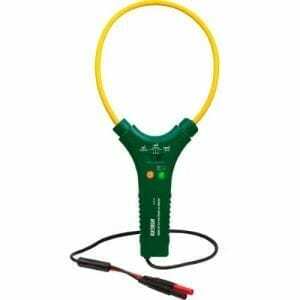 Duty cycle, continuity, diode testing are also included. 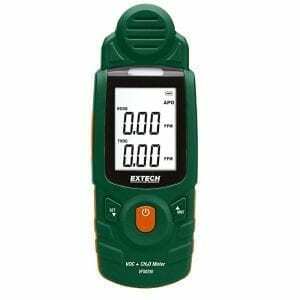 Part of the Extech’s precision is its True RMS functionality. 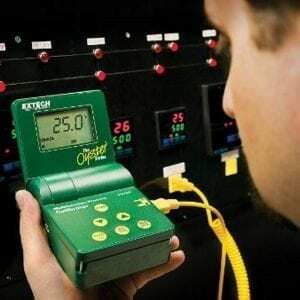 It can be very difficult to make accurate current and voltage readings in industrial and commercial applications when electronic devices are present. 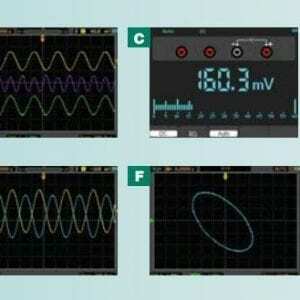 Fluorescent lights, motor drives, computer power supplies, and other electronic systems can distort the AC waveform, making it hard for averaging meters to get an accurate read. True RMS uses a more advanced formula to compensate for this kind of distortion. In addition to its 20 kHz ACV bandwidth that helps to paint an expanded picture of measurements, the MM560A offers a wide array of frequently used functions: maximum/minimum recording with autoranging, Auto Power off; Relative and Hold; and a robust Peak function that captures transient pulses. 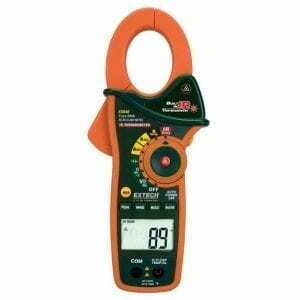 For convenience, the meter recalls the last function used when powered up. 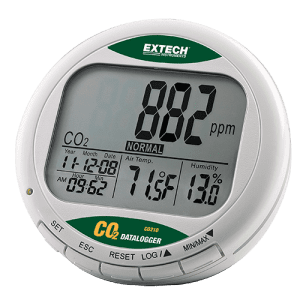 You can expand the versatility of the MultiMaster with optional Windows compatible PC communication software and optically isolated cable to transfer, manage and analyze readings on your computer. 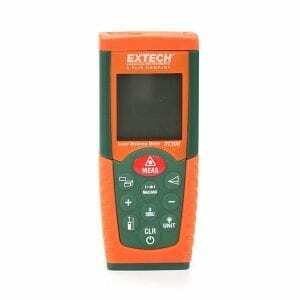 Technicians can be confident the meter is backed by a CATIV-600-volt overvoltage safety rating, protecting users even on devices that are connected to raw voltage distribution lines.